I have always thought that the traditional and oft used description of Patrick Hamilton’s 1938 play, Gaslight, as a mystery-thriller was a misnomer. Far from being a mystery, there are no twists and turns or searching for culprits or even a big surprise climax. Instead the malefactor is outed with almost iron-clad certainty in Act 1 with only few extra details uncovered later in the play leading to his expected arrest. Gaslight fares somewhat better in the thriller department with one great suspenseful scene to start off Act II, but then quickly devolves into the obvious happening at the expected moments. So then, why is this story so successful? Gaslight was an immense hit when it premiered in London. It went on to become one of the longest-running non-musicals on Broadway and inspired two film adaptations, with the 1944 American version nominated for seven Oscars and landing Ingrid Bergman the Best Actress Award. The reason for the story’s appeal is simple. What the plot lacks in classic edge-of-your-seat mystery genre tautness, it makes up for in the personal inner tension and terror of the plot’s main female character. Or at least that’s the idea if the production is going to be a success. 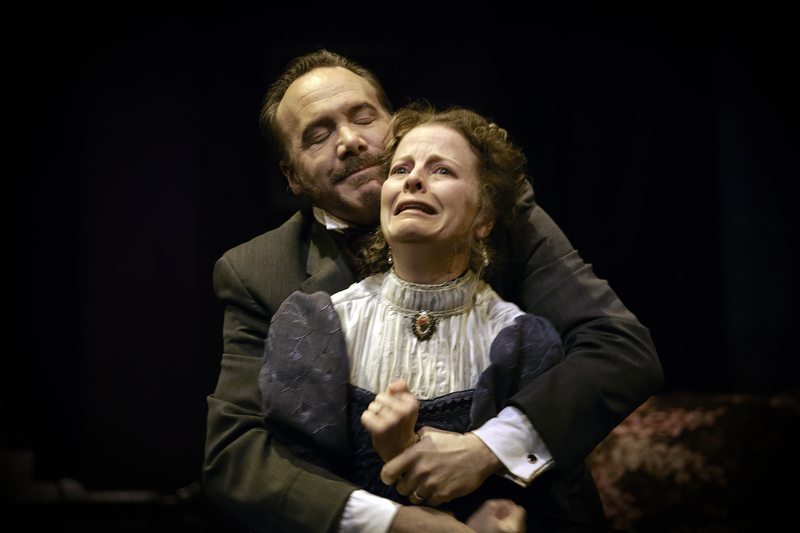 The play is set in the 1880s at the home of Jack Manningham (Robustly yet at times too theatrically played by Patrick McManus) and his young wife Bella (The antsy and emotive Anna Cummer). Right from the outset of the story it’s apparent that Bella is anxiously disturbed by her husband’s reproachful and insensitive quips at her, his overt flirting with the servants and his nightly unexplained disappearances from the house for several hours. Her submissive and almost self-flagellating response to her husband’s emotional abuse, we learn, is the result of months of scheming by Mr. Manningham to convince Bella that she, like her mother before her, is going insane. But it isn’t until a retired police detective named Rough (played with perfect pitch by Christopher Hunt) shows up to the house to speak with Bella in private that she herself learns of her husband’s deceit. Not just against her sanity, but in matters of murder as well. It turns out that the house the Manningham’s are living in was the site of a crime some years ago where an old woman was murdered for her precious jewels, which the killer never found. Still on the loose, Rough believes that he has identified her husband as the murderer and that Bella is being used in his plot to finally find the gem’s hiding place within the house. As I said, the plot in this “mystery” is laid bare quite early and all we are really left with is Jack’s evil abuse and Bella’s tormented mind to witness as a type of psychological thriller tale. In fact, this narrative arc was so successful in the original stage and film adaptations that it gave rise to the clinical term ‘gaslighting’, meaning psychological abuse whereby false information is systematically presented to a person with the intent of making them doubt their own sanity. It’s a shame then that renowned Director, Christopher Newton (the original founder of Theatre Calgary and Artistic Director of the Shaw Festival for 23 years) didn’t quite manage to bring the squirm-inducing discomfort of watching a woman wrestle with her sanity or the empathetic terror that audiences really need to connect with this script. Newton’s direction was swift and confident and he did manage to draw out strong performances from his cast. However so much of Bella’s flitting-about spiral into insanity took place upstage and center stage resulting in literal and metaphorical distances between audience and character. In addition, her whirlwind behavior without pause leaves little room for true pathos.We watched her struggle instead of feeling it. And for me, that was the difference between losing myself in the play and merely witnessing it. Anna Cummer had all the talent to make Bella a true tragic figure that eventually gets her revenge, but she is blocked in her attempts in this case by some uninspired direction. This doesn’t stop the show from being good – the audience gives their attention happily – but it stops it from being great.